Brian Fuentes recently inked a contract with the Angels to replace Francisco Rodriguez as closer. And as weird as this may sound…the Angels may have upgraded. I won’t argue the merits or drawbacks of Rodriguez (although I have in other places). However, Fuentes has quietly been very good over the last couple years. Last season was particularly good. Fuentes struck out nearly 12 batters per nine innings, while walking 3.16. He also allowed only three homers in 62 innings – although this is mainly due to an inordinately-low homer rate, as only 4.5% of his fly balls became homers. However, in his career, only 8.7% of his fly balls have become homers, so even though he tends to allow a lot of fly balls, he doesn’t allow too many homers. Last season seems like it’s somewhat of an outlier in Fuentes’s career – but not by that much. His career strikeout rate is 10.24 per nine innings, and his career walk rate is 3.82. It’s fair to assume that Fuentes won’t quite approach last season’s peripherals or ERA, but it’s very reasonable to assume that Fuentes will strike out more than one batter per inning and will post an ERA in the 3.50 – 3.80 range (if that seems high, keep in mind that Fuentes will be moving to the more difficult league, even if he’s also leaving Coors Field in the process). The key to Fuentes’s value in fantasy leagues is his situation. Fuentes signed a big-dollar deal to be The Closer for Los Angeles, a team which has thrived on having relievers in set roles. Therefore, Fuentes’s job is very safe – even if he pitches poorly in back to back outings, he’s unlikely to be relieved of his closer duties permanently. Furthermore, Fuentes has relatively little injury history, so even though he’s risky by definition (most relievers are fairly risky), he’s not a huge injury risk. Additionally, although this may seem somewhat counterintuitive as a positive for Fuentes, the Angels aren’t going to be very good next year. Their offense overachieved in 2008 and they have lost Mark Teixeira and Garrett Anderson, leaving their offense as potentially one of the worst in the American League. This actually bodes well for Fuentes, because it means that the Angels aren’t going to blow many teams out. Rather, when they do win games, chances are the games are going to be close, leading to a lot of save opportunities for Fuentes. This is what allowed K-Rod to rack up so many saves last year, despite being no better than average at converting save opportunities into saves. All in all, Brian Fuentes is a low-risk, above-average reliever who is likely to have a lot of save opportunities. Furthermore, he’s unlikely to be removed from the closer’s role if he struggles a little bit, and he should post solid numbers, even if they regress from last year’s numbers. Fuentes is likely to be available after the “top tier” of closers have been taken, and is the exact type of pitcher you should be targeting. WHIP is a silly thing. Some people like to refer to it as a newfangled Moneyball stat, alongside VORP and tRA. But WHIP is old-fashioned, and not particularly indicative of player skill. Of course, pitchers who don’t walk anyone and don’t give up hits tend to be better pitchers, but we don’t need WHIP to tell us how good these pitchers are. WHIP is a byproduct of many other stats, and therefore should essentially be ignored when assessing pitchers. That’s right: ignore WHIP. Because if you draft good pitchers, they are almost certainly going to have good WHIPs. In fact, there are very few pitchers whose WHIPs differ dramatically from their ERA and strikeout ability. And often times, when there is a significant difference between WHIP and other statistics, it’s a fluke, and unlikely to be repeated the next season. It follows that pitchers with low ERAs tend to have lower WHIPs as well. Pitchers who have low ERAs tend to either get a lot of strikeouts or a lot of ground balls – or, failing this, they at least drastically limit their walks. Having a good WHIP is a byproduct of these three other skills: avoiding balls, missing bats, and inducing grounders. If you look for pitchers with these skills, their WHIP will follow. The only exception for this is the mid-season tweak rule. Somewhere around July 1 (there’s no exact date, but the later the better), all bets are off: you need to tweak your roster accordingly, and most of what you read before the season can be thrown out the window. If there is one pitcher who has a particularly good WHIP and your WHIP is very high, there is nothing wrong with trying to obtain that pitcher – just be careful that the WHIP is for real, and not the byproduct of unsustainable luck. In general, though, if you acquire a pitcher who avoids walks, gets strikeouts and induces grounders, that pitcher will have a more than respectable WHIP as well. And you won’t even have to look at that category. Last season began well enough for Aaron Harang. Harang had a 3.50 ERA, more or less what we’d expect given those peripherals. But then, Dusty Baker made an interesting decision. On May 22, Aaron Harang made a start on normal rest. Then, on May 25, Baker brought Harang into a tie game in the 13th inning. Harang proceeded to pitch 4 shutout innings, striking out 9 and throwing 63 pitches in the process. Harang’s next start was on May 29. Starting pitchers have been known to pitch an inning out of the bullpen between starts, but Harang threw 63 pitches – in a tie game, no less. Of course, Harang has had a rubber arm over the last couple of seasons, having pitched over 200 innings in three straight years. If anyone could handle the added workload, it would be Harang, right? His strikeout rate was approximately the same, but he walked one more batter per nine innings. His homer rate also skyrocketed. The question is: was Harang unlucky – thanks to a very-high BABIP and homer rate – or was he hurt? He posted a 2.83 ERA over these eight starts. On the one hand, Harang’s peripherals didn’t really change too much throughout the season, even after his bullpen stint. His walk rate rose, and it’s very possible that fatigue caused him to lose control of his pitches. However, his strikeout rate remained high, and it’s possible that his high BABIP and high homer rate could be more attributed to bad luck in a small sample size rather than anything else. On the other hand, it’s difficult to ignore the fact that Harang’s ERA changed drastically directly after his outing in the bullpen. If he did indeed lose control of his pitches (as evidenced by the higher walk rate), it’s not difficult to surmise that he was also grooving an inordinate amount of pitches, leading to a higher BABIP and higher homer rate. After he returned from the DL, his first two starts were awful, but this can be very easily be attributed to the fact that he wasn’t yet fully healthy. In his final eight starts, Harang more-or-less returned to “normal” form. His BABIP was actually a little low, and his strikeout rate was lower than before. Again, it’s difficult to tell whether this is significant or the product of a small sample size. If I had to guess, I’d say that the bullpen stint somehow screwed Harang up. It’s very possible that his 7.31 ERA was inflated partly due to bad luck, but it’s also clear that Harang was not as good of a pitcher after the bullpen outing as he was beforehand. It’s also clear that Harang was pretty much back to “normal” after returning from the DL (well, after his first two starts). This is further evidence for Harang actually being injured. For next year, it’s fair to expect Harang to return to his normal numbers – his numbers before 2008. That means that he has the potential to be very undervalued going into drafts next year. There is, of course, a caveat: namely, the possibility that Harang is not fully healthy. This seems unlikely, however, given his performance over the final eight starts of the season. Aaron Harang plays for a mediocre team, in front of a poor defense, in a hitter’s park. However, he is also a very good pitcher who is likely to put up numbers that are much better than his 2008 line. It’s reasonable to expect an ERA between 3.50 and 4, and a strikeout rate somewhere around 8 batters per nine. Harang is probably going to be undervalued in your league, and is an excellent sleeper. Year in and year out, Ichiro is a model of consistency. He has had over 200 hits and a batting average over .300 every single season he’s been in the majors. He’s also scored at least 100 runs every year, and stolen at least 30 bases. That being said, what can we expect from 2009? The short answer, of course, is more of the same. When a player is this consistent for this long, the best predictor of his performance is his past performance. With that in mind, Ichiro is also getting older – he’ll be 35 next year, and even though he is a unique player, he’s not totally immune to the effects of aging. In fact, this is already beginning to show up in his batting average. In 2008, Ichiro hit “only” .310 – the second lowest batting average of his career (in the North American Major Leagues, that is). However, he managed this batting average despite a higher-than-expected BABIP – his actual BABIP was .330, but his expected BABIP (according to a new model I introduced) was .307. Before you tell me that Ichiro is unique, hear me out: yes, I agree that Ichiro is unique, but this new model attempted to incorporate many of the elements that make Ichiro unique – such things as hitting to all fields and speed, two elements of which Ichiro makes particular use. Note the average: since 2005, the model has underrated Ichiro’s BABIP by approximately 23 points. Now, I think this is somewhat unfair, as the average is severely skewed by Ichiro’s incredibly-high BABIP in 2006, which was well out of line with even his own already-high numbers. But if we assume that the ~23 point difference is correct, well…that means Ichiro’s BABIP in 2008 was completely luck free. What’s perhaps more interesting to note is the downward trend of Ichiro’s expected BABIP – it has declined each year since 2005. This goes along with conventional aging patterns – Ichiro was 31 in 2005, and as he exited his prime, his expected BABIP slowly dropped. This suggests to me that Ichiro’s batting average is a lot more likely to go down than it is to rise. Of course, it’s certainly possible that he has another flukey BABIP year that allows his BA to rise once again, but this is increasingly unlikely as he gets older. Even though Ichiro’s .310 batting average was the second lowest of his career in 2008, it doesn’t appear that this was a fluke, but rather was indicative of him slowly getting older. That doesn’t mean Ichiro won’t have significant value in fantasy leagues next year – after all, he’s still shown that he can steal 40+ bases and hit over .300 – but don’t draft him expecting a resurgence to the AL batting title. Jimmy Rollins probably left many fantasy owners disappointed last year. He hit .277/.349/.437 with 11 homers and 47 steals in 137 games. Obviously, those are good numbers, but they are may be a little below what optimistic owners were expecting. What can we expect from Rollins in 2009? Let’s start with batting average. Rollins hit .277 last year, after hitting .296, .277, .290 and .289 over the last four seasons, respectively. Rollins’s strikeout rate was actually the lowest of his career last season, as he struck out in only 9.9% of his at bats. Over the last five years, his K rate has hovered right around 10-12%. 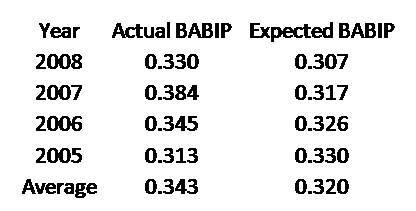 However, last season Rollins’s BABIP was .285, but his expected BABIP (according to a new model I introduced) was .323. If you add in those “missing” hits, Rollins’s batting average becomes .311. Additionally, Rollins improved his walk rate in 2008 – he walked a career-high 9.4% of the time, the first time in his career that he was even over 8%. This led to the highest OBP of his career, despite the (relatively) low batting average. As a result, Rollins had more opportunities to steal bases. Furthermore, he stole bases at an incredibly efficient clip, getting caught just three times in 50 attempts; this continues a trend that began in 2005 – since (and including) that year, Rollins has been successful on 165 of his 184 stolen base attempts, an impressive 90% conversion rate. Perhaps the most disappointing thing about Rollins’s 2008 was his power – or lack thereof. He totaled only 11 long balls, after hitting 55 over the previous two seasons combined. Part of the problem was that Rollins played in only 137 games in 2008, after having played in every single game in 2007 and 158 games in 2006. More of the problem appears to be the fact that Rollins stopped hitting fly balls – only 30.6% of his balls in play were fly balls in 2008. In 2007, Rollins hit fly balls 44.2% of the time, but that appears to be an outlier in his career: in the three seasons before 2007, his fly ball percentages were 36.9%, 32.1% and 35.8%. His fly balls became homers at a lower rate in 2008 (7.7% of his fly balls left the park) than in the past two years (11.1% and 10.7%, respectively), but his career HR/FB is 8.8%. The biggest problem was Rollins reverting to his ground ball tendencies – an issue that could have to do with faulty mechanics and/or the sprained ankle that sent him to the DL in April (although I highly doubt a sprained ankle would sap a player of his power). However, it could simply be that Rollins’s 2007 season was a fluke in terms of fly balls – he hasn’t hit nearly as many fly balls in any other season. If we assume that Rollins’s fly ball totals from 2007 were out of whack, so too must we assume that the 30 homers he hit that season are likely going to be a career high. It’s certainly possible that Rollins will regain some homers from his dismal 2008 year (dismal in terms of power production, that is), as his fly ball rate will probably rise somewhat, and he could see a slightly higher proportion of his fly balls leave the park. Still, an increase in these two areas would probably yield somewhere around 15-20 homers, maybe 25 (assuming Rollins stays healthy all season). As Rollins will be 30 years old next season, it’s quite likely that he won’t match his age with his homer total ever again. However, even accounting for Rollins’s relative lack of homers, it appears that he improved his game in other facets this season – improvements that he may carry with him into next year. Rollins is still an incredibly efficient base stealer who also runs often, and this should continue next year. Furthermore, if Rollins can take his improved strikeout- and walk-rates with him into next season, he could see a rise in his batting average (remember, his batting average should have been .311 this year) and OBP, leading to more opportunities to steal bases and more runs scored atop a powerful Phillies lineup. You shouldn’t draft Jimmy Rollins expecting 30 homers, but you can reasonably expect 15-20 bombs, and perhaps even a batting average of around .300 and upwards of 50-60 steals. That’s still a heck of a player, especially for a shortstop. Let’s say you’ve signed up for a fantasy baseball league – either with your buddies, or a public league with people you’ve never met before. Let’s say that you’re in a league with prizes – a league in which you probably had to pay some sort of entry fee. You plan on spending a lot of time fine-tuning your team throughout the season. Obviously, your goal is to win this league. If you want to win, don’t get caught up in being a fan. I don’t care if you passionately hate the Yankees – if Alex Rodriguez is available in the second round, you had better take him. I don’t care if you bleed Cubbie blue – don’t draft Kosuke Fukudome in the 8th round. If you really want to win, you have to remove your own fandom from your fantasy team. This is often more easily said than done. Some people just can’t stand the sight of players they hate manning a roster spot on their beloved fantasy team. Others can’t stand seeing their favorite guys wasting away on an opponent’s roster. But if you’re going to pay money and dedicate all of this time you building a winning fantasy team, don’t undermine your own efforts. Just because you have Arod on your team doesn’t mean you have to become a Yankees fan, and just because you don’t have your own guys on your team doesn’t mean you can’t root for them. Separate fantasy from reality. You just have to get over it, or make the decision that rooting against Arod is more important than winning the league. There’s nothing wrong with deciding that, either – to each his or her own. But you had better understand the consequences of such a decision, and be okay with it. You can’t decide against drafting Arod and then complain if you don’t win your league – you had the chance, and you decided you that your hatred of Arod was more important than winning. So don’t be surprised if you lose. You can be a fan and be a fantasy player at the same time. Just make sure to keep them separate.